This is a Cooper’s Hawk. A juvenile Cooper’s Hawk at Fishhawk Lake. Although I didn’t know it when our two dogs flushed it out of a tree two doors down from our lakefront home on Fishhawk Lake. There was a small pile of feathers at the base of the tree where he had been. He flew up high and landed in a twist of limbs way above my head. I dashed home with the dogs, left them there and grabbed my Canon Rebel EOS T3i. Once I got the photos downloaded on my computer, I started doing my research. Adults are much darker. I will include information from National Geographic on the description of Cooper’s Hawks, but first I want to share how I got him to look at me like this. He was a real beauty and I knew he was young, even though I didn’t know what kind of hawk he was. Talk about being in the right place at the right time! The “chicken hawk” of colonial America, this medium-sized accipiter is a common sight at home bird feeders across the country, swooping in to nab an unwary dove or jay. Females are larger and bulkier than males, juveniles differ from adults. Monotypic. Length 14–20″ (36–51 cm); wingspan 29–37″ (74–94cm). Identification The long tail is rounded at the tip, also the relatively short wings and flat-topped head are good field marks. Eye is close to the beak. Crown merges with forehead and bill in a smooth line. Adult: blue-gray upperparts, the crown is darker and contrasts with the lighter nape and buffy cheeks, giving the look of wearing a “beret.” Eye color is orange to red. Undersides with rufous barring, undertail is white. Juvenile: brown above, with rufous edges and white spots on upperwing coverts. Tail long, with straight bands and wide, white tip that wears down by spring. Head usually buffy, eyes pale yellow. Undersides are white with thin brown streaks, white undertail. Flight: wings typically held straight out from body, head, and neck projecting forward. This along with tail length make a “flying cross” appearance. Shallow, quick wingbeats alternate with short glides. Geographic Variation Western populations hunting more open country are smaller, with longer wings, shorter legs than eastern birds. Plumages are alike. Similar Species Northern goshawk is usually larger, heavier appearing, and has relatively shorter tail and longer wings. 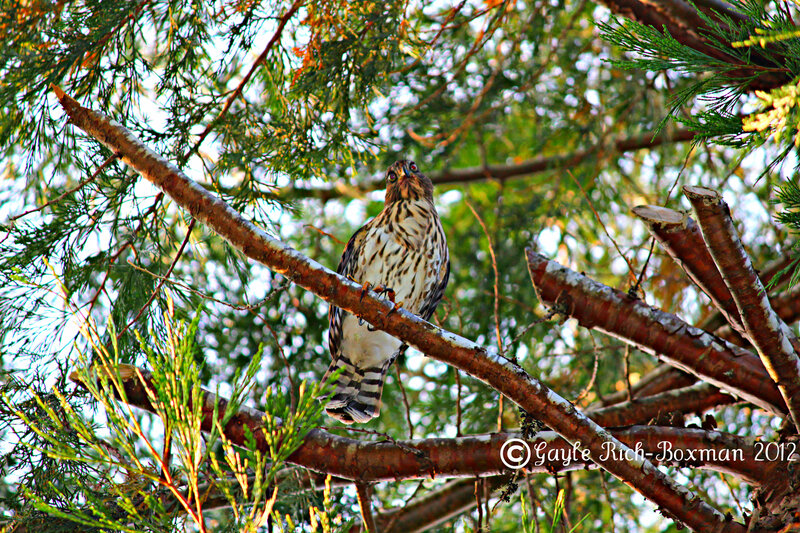 Sharp-shinned hawk is smaller and has a square tail. Voice A low keh-keh-keh uttered around nest, occasionally mimicked by jays. Status and Distribution Widespread through United States and southern Canada, more commonly seen in suburbs, probably due to reforestation in the East. Breeding: nests in a variety of forest types, preying on small- to medium-size birds and small mammals, hunting from perches under the canopy. Migration: in­creasing numbers at eastern hawk-watches probably due to better identification skills. Winter: juveniles winter farther north than adults; eastern birds move to the southern states, western birds to Mexico. Population Common and stable in the West, increasing in the East. Want to learn more about our feathered friends of the sky? Visit our Backyard Birding site for facts, photos, videos, and more. This entry was posted in Birds, Living on a Lake in the Country, Nature, Nature at Fishhawk Lake, Photoblogs of Fishhawk Lake, Wildlife Photos of Fishhawk Lake and tagged bird photographs at Fishhawk Lake, Cooper's Hawk, Fishhawk Lake wildlife, Wildlife. Bookmark the permalink. I amm really grateful to the holder of this site wwho hass shared this fantastic piece of writing at here.